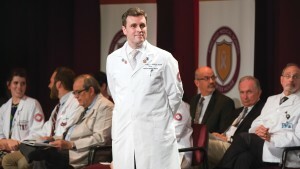 Chicago Medical School Dean James Record during the CMS White Coat Ceremony, held Aug. 10. 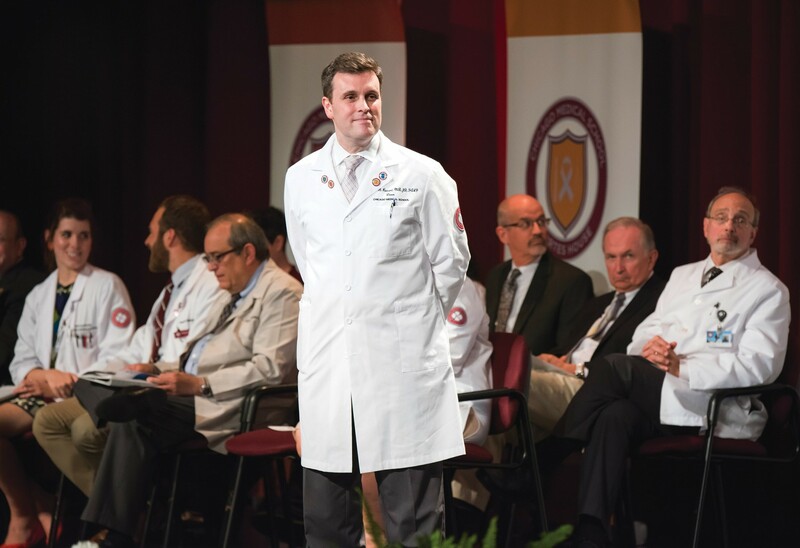 Chicago Medical School Dean James Record, MD, JD, FACP, shares in the following Q&A his vision for the school's new curriculum, the first full redesign in the school's 106-year history. Introduced to new students this fall, it integrates clinical and basic science, engages students in active learning and provides early clinical experiences in the community. CMS is one of many medical schools around the country overhauling its curriculum. To what do you attribute this trend? Interest in redesigning medical education and residency percolated in the early 1990s through the 2000s but really took off after the 2010 Carnegie report, which recommended changes to the 100-year-old Flexner model of medical education. That model includes two years of didactic scientific foundations followed by two years of learning in clinical settings. The report recommended four key changes: integration of scientific knowledge and clinical experience; standardization of learning outcomes and individualization of the learning process; development of habits of inquiry and innovation; and focus on professional identity formation. Mindful that we had more than 100 years of success with residency placement under the old model, we took three-and-a-half years to study and design our new approach in which students learn based on a scaffold built of clinical connections, which we think will provide a more concrete and effective learning tool. It wasn't that the original was broken, but rather needed enhancement. A curriculum is a living entity. Ours had undergone minor changes each year with individual courses that maintained the original structure. Now we're undertaking a structural change. What are some of the key areas of change? We're integrating previously siloed areas. We used to teach biochemistry and molecular biology, physiology, pharmacology and bioethics as discrete courses. We focused on one, then shifted to the other. But if you're addressing a patient concern, you must be able to synthesize different biological processes. Biochemistry, pharmacology and bioethics may all be wrapped in one patient visit. Our new curriculum starts with clinical and scientific foundations and quickly progresses into patient-oriented, systems-based education. So if we look at the cardiovascular system, which we call a system block, it integrates what were previously discrete courses into an organization that is clinically focused and premised on a patient concern. We begin the blocks with a patient who presents for evaluation. We're modeling the style of the physician as a lifelong learner with the style of the student — physician to be — as a learner. Over the course of the week, after the patient case is presented, we teach an integrated curriculum that also involves the student taking the responsibility to teach some of the material, which is what all physicians must do. They don't just practice, they teach. At the end of the week, a formative quiz assesses the integrative learning that's happened — all revolving around that patient concern. The goal is to have a more visceral representation — a clinical scaffold — on which to build your foundational science. In doing so, that more tangible element is easier to retain. How does the new curriculum support retention? For example, a patient presents with a sore throat. We need to review the anatomy of the throat, the physiology, the microbiology of the oral flora, etc. There would be some pharmacology in treating potential infections and other disorders. In doing so, we're now looking at that specific area of concern and developing a differential diagnosis in the students' minds. That is one of the most critical elements of medical practice. Everything follows from synthesizing information into diagnoses. We're teaching students to listen to the patient first — from the beginning of their education. Medicine is not the simple acquisition of knowledge that you then apply to a patient. It's about understanding your role to serve within the context of a patient's needs. What's the role of humanities? When we present a patient, we're not simply presenting a symptom, but a complex human being. To address that, we have vertical threads that run through all four years of the curriculum — health promotion, wellness and nutrition; interprofessional, interdisciplinary team-based care; population health; safety and quality; evidence-based care; ethics; professionalism; and humanities. Understanding humanities provides a wider lens to understand context, which is the path to effective treatment. Our threaded humanities reflect different perspectives so our students have an appreciation of the components that surround the life of the patient and that can impact patient care and self-care. Patients exist within a complicated social structure that plays a major role in health promotion and disease prevention. What's something unexpected our students might learn in the humanities thread? Okay. How might a Rembrandt painting yield clues in identifying someone in heart failure? Rembrandt's work "The Night Watch" is a beautiful example of the chiaroscuro [the contrast between light and dark] — that creates a compelling distinction. The same element of contrast revered by generations of art historians is essential for performing the physical examination of jugular venous pressure. Backlighting the jugular vein creates a forward shadow during the period of volume expansion. That contrast helps students relate to that physical examination technique, the angle of lighting that creates the same effect in "The Night Watch." That juxtaposition also provides the student, I believe, with an appreciation of the greater art, which is really not the medicine as much as connecting with the human. That interplay of the humanities and the science mirrors the foundational aspects of the social contract between patient and physician; investigating the connection yields greater understanding. How will the curriculum be interprofessional and team-based? Interprofessionalism and team-based care have been our foundation, even in the former curriculum. Connecting both within and beyond the professions is an expansive core part of our new curriculum, which educates within the context of the healthcare team. We have the benefit at RFU to incorporate interprofessional teams of students from a rich variety of programs: pharmacy, podiatry, physician assistant, nursing, psychology, to name a few. In addition, the curriculum focuses around student groups of eight, learning and teaching each other in team-based fashion. How will the new curriculum be assessed? We're taking a stepwise approach to ensure quality. We've spent time over the planning of the curriculum to address system supports to evaluate and ensure student outcomes are at least as good as they've been in the past. We expect that, ultimately, the outcomes will be superior and that the satisfaction of the participants will be better. Our pilot programs have already suggested that, and that we will continue to progress as we accumulate more data to support even greater changes.